All we know about the Husnock is that they are a species of hideous intelligence that knew only aggression and destruction. And that's likely all we'll ever know about them either, seeing as Kevin Uxbridge managed to kill every mother, every baby, every Husnock, everywhere. So when the ship suddenly shows up to interfere in the Enterprise's mission, who's driving that thing? The answer, it seems, is that nobody is driving it. At least, in this version of it nobody has to be driving it. A seven-cost ship with low Range and no Weapons might seem like a bit of a burden to play, not something you'll want to use every day. But if you decide to send it against your opponent the way that Kevin sent it against the Enterprise, it becomes significantly better. With Range 8 and no staffing requirements (and I really mean no staffing requirements... not even a personnel on board! ), it can follow your opponent to any mission they want to attempt, with no resource cost to you past the initial cost to play it. And once it's at your opponent's mission, as in the episode, it certainly does make that mission harder for your opponent to attempt: one free draw and counter to spend on your dilemmas for every attempt at the mission. And again, the notable thing here is that you can do that with no further resources spent. Any other cards with similar powers either destroy themselves or some other cards or resource in order to activate the power, which gives you a limit on how often you can use it. With this ship, you can use it every attempt for as long as it follows your opponent around. How can you make this ship as effective as possible? Start by playing a Blind Spot on it, to make sure your opponent doesn't sneak away and attempt a mission without you. And while you're at it, put a New Discovery in play, and every turn that you didn't need to move, you can make a quick jump to one of your opponent's other missions and back (probably their headquarters, for the low span), and help out your own mission attempts at the same time. This works because Blind Spot uses your next turn's Range, so you never need to worry about "saving" any to use later... if you've still got it, you might as well use it. Of course, if you ever get in a tight spot, you've always got the chance to use this as your own ship (in the event that your other ships all blow up). But it loses the autonomy and gets a lot slower, so it's probably not going to be your first preference. 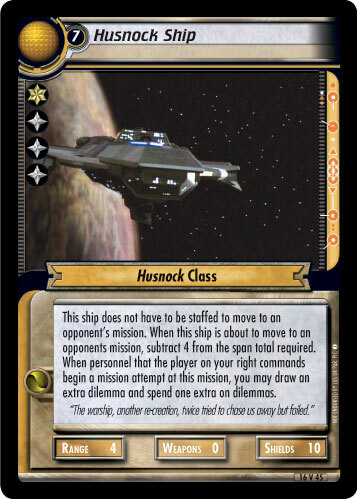 And who ever thought you'd be adding a ship into your deck with absolutely no intentions of ever actually putting any crew on board?